Like it or not, Valentine's Day is right around the corner. 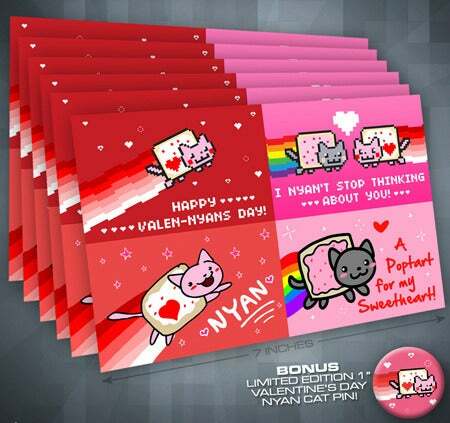 For the geeky couples who happen to like the romantic event, here's something awesome to keep in mind: Give your other half, friends, classmates, or even colleagues these cute Nyan Cat Valentines Day cards. Available on Level Up Studios, the 24-card set includes four different designs, all featuring a Nyan Cat themed for the occasion. If you aren't giving them out to numerous people for fun, then this means you're pretty much set for the next 24 years in cards! Which one will you pick for that one significant other this year? "A poptart for my sweetheart," "I nyan't stop thinking about you," "Happy Valen-nyan's Day!," or a lovely close up of our favorite cat meme? In addition to all the cards, your $7.99 will get you a free Nyan Cat pin badge, and my respect for life. Actually, I seriously hope one of these cards turns up for me, or I'll be bitterly disappointed. If you are not familiar with the Valentine Nyan skin and track, watch it on the official Nyan Cat page (it's not quite as annoying, honest! ).